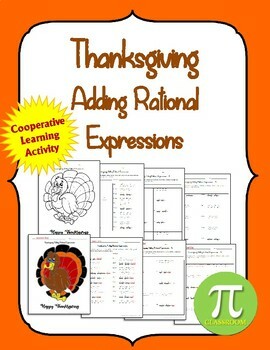 Students will add and simplify rational expressions. There are 20 problems total. Students can work in cooperative learning groups in which Partner A does the left side and Partner B does the right side. 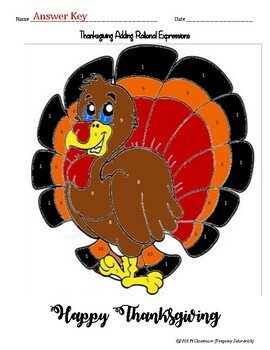 Then they will match their answers to color the turkey accordingly. Products by Yevgeniy Sidorevich (Pi Classroom) may be used by the purchaser for their classroom use only. All rights reserved. No part of this publication may be reproduced, distributed, or transmitted without written permission of the author. This includes posting this product on the internet in any form, including classroom/personal websites or network drives. If you wish to share this product with your team or colleagues, you may purchase additional licenses from my store at a discounted price.